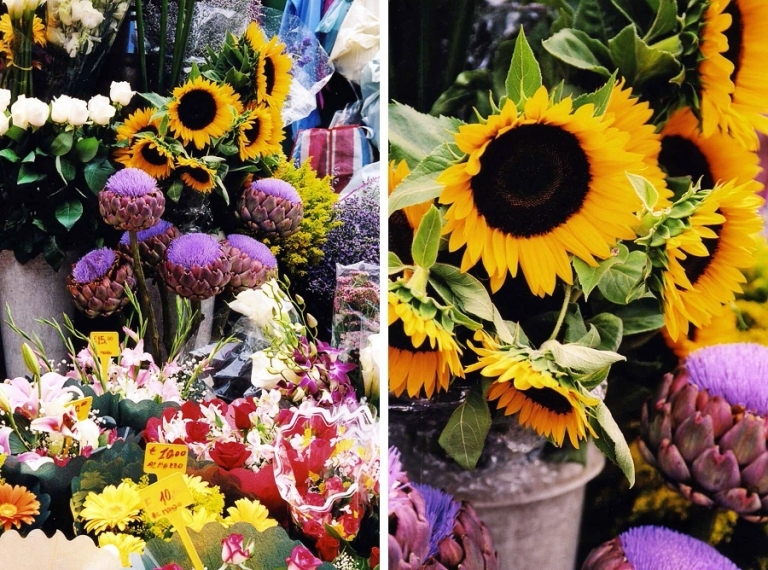 Sub-title: The time I spent a day wandering around Milan, Italy by myself. 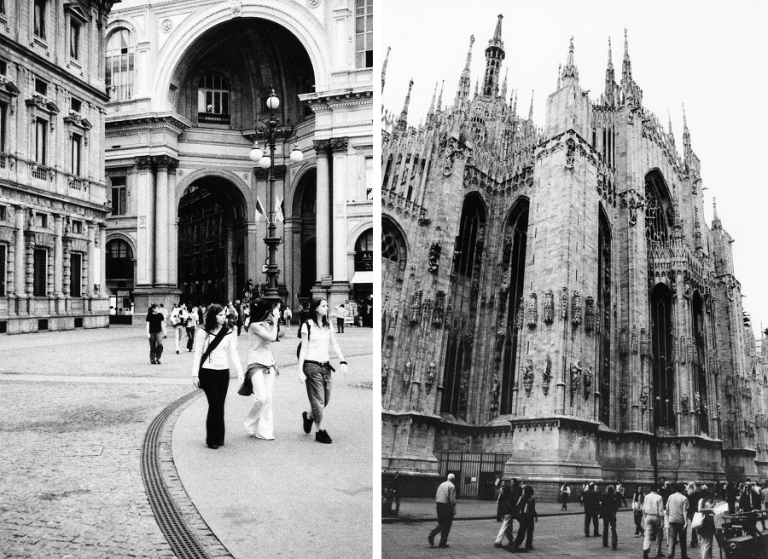 As promised, I have a couple of photos to post from my day trip to Milan that I’ve finally scanned from film. While Chris and I were staying in Lugano, Switzerland, I signed up for a day-trip bus tour that went across the border to Italy. Chris had to work that day, but I figured it would be safe enough to go by myself since I’d also be accompanied by a bus full of tourists and a guide who could keep an eye on us. It was only about an hour-long ride into the heart of Milan, and the tour stops included Sforza Castle, the Monumental Cemetery, and the Duomo Cathedral. Oh, and when I say “tour,” I actually mean we were dropped off at each of these spots and given time to wander around on our own. So much for safety in numbers! But I did enjoy the freedom of seeing whatever I wanted at my own pace. 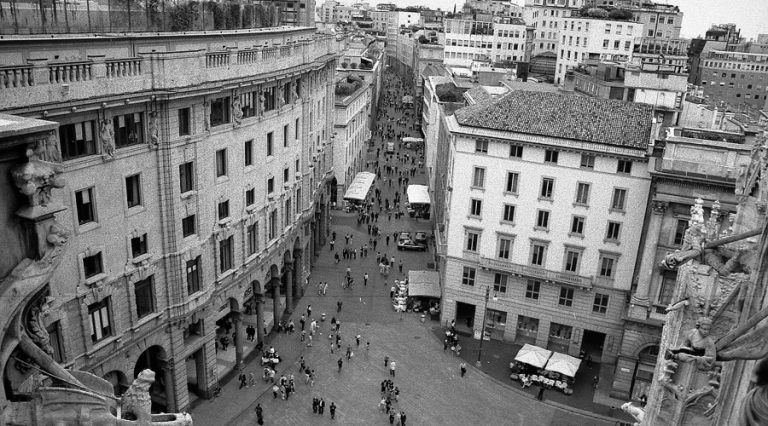 The piazza was fantastic for people-watching. I had some fun interactions with the locals using my broken Level 1 Italian, and also some not-so-fun moments. 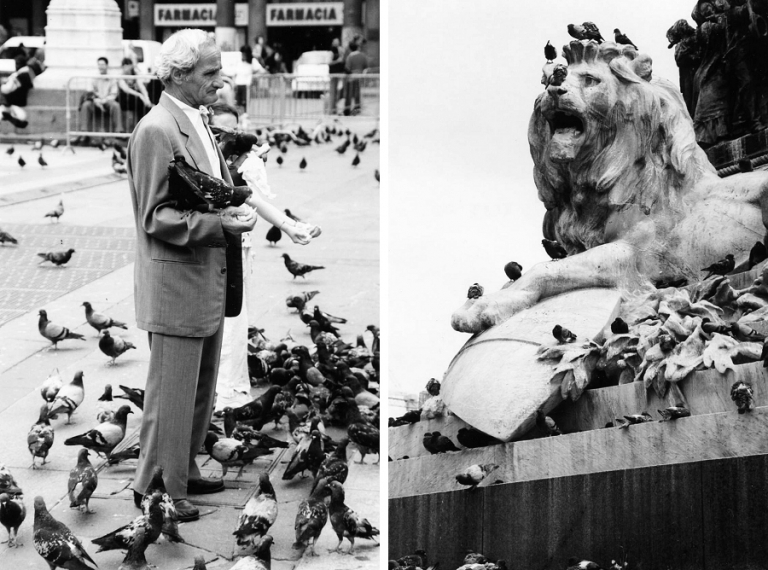 See all of the pigeons in the photos below? Apparently some tourists think it’s super fun to have their photo taken with the birds, so there are vendors (?) milling about who give you corn to feed the birds and then volunteer to take a photo for you in return for a small tip. I had no interest in a pigeon photo, but this guy kept insisting (in Italian) that I must have one. He grabbed my hand and put corn in it, while also trying to take my camera out of my other hand. Thankfully I had the neck strap over my head like a true tourist safety-conscious photographer and he was not able to get the camera away from me. He probably meant well and just wanted a few Euros in exchange for the photo op, but I couldn’t be too sure. And I don’t easily separate from my camera! So I shared some polite/nervous laughter and politely refused the photo. Oh, and did I mention I had about two-dozen pigeons on my arms and shoulders and surrounding my feet at this point? Yeah. Pigeons like corn. A lot. So there were quite a few birds that accosted me, and there was quite a bit of arm-flailing on my part, all while trying not to let a random Italian dude take my camera from me. Rather than a photo, I wish I had video of that whole scene because I’m sure it’s pretty hilarious. One of the last stops of the day was the Sforza Castle, where I had the privilege of seeing Michelangelo’s Rondanini Pietà, the last sculpture that he worked on in the last days of his life. We weren’t really supposed to take photos (I’m not sure if this rule is still current or not?) but I did snap one careful image when no one else was around. Side note: I’m assuming light from the flash is the main reason photos aren’t allowed, so I’ll just mention that I took a very quick photo without flash and without interrupting anyone else’s viewing experience. Milan was absolutely stunning, but I know it’s just a small slice of Italy, so I can’t wait to go back some day and travel the whole country. And with Chris this time of course!